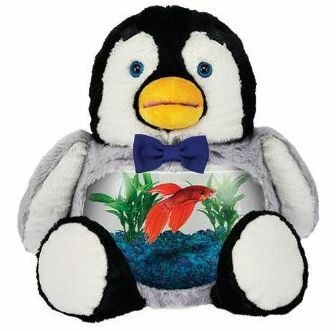 Teddy Tank - Stuffed Animal that's also a fish tank is two types of fun. The stuffed animal and a fish bowl in the belly. Kids love feeding fish with teddy tank by feeding items through its mouth! Includes a clear plastic 1 gallon tank. Not just for fish! It can also store snacks, candy, toys and more.